Can Bitcoin Price Rally Continue After Paypal Fake FUD Attack? The Bitcoin price has bounced back strongly after it's recent wobbly following the apparently fake PayPal 'Fear, Uncertainty and Doubt' FUD attack last Friday with the price recovering from a recent low of $7,350 to currently stand at $8,400, that has the Bitcoin community breathing a huge sigh of relief believing today's rally to mark the end of the pain of the past 3 months that has witnessed the Bitcoin price collapse from a high of $20,000 to a low of $6,600. So is this the start of a recovery for the Bitcoin price back to $20k and beyond? Or is it merely the calm before the next leg of the bear market storm that could see Bitcoin revising the bear market low of $6,600 and worse. 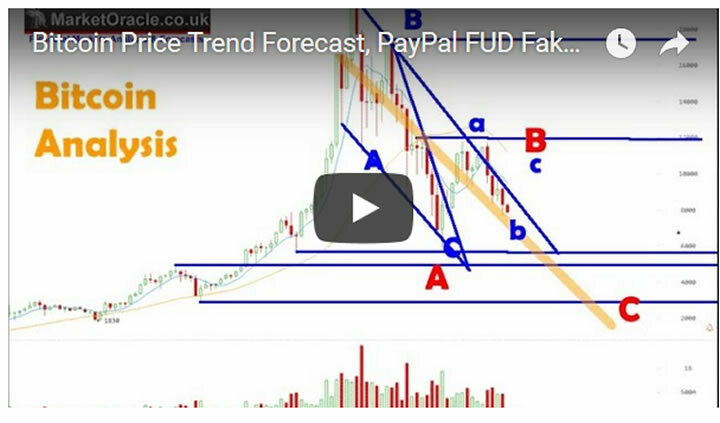 Find out in my latest bitcoin price forecast video update.